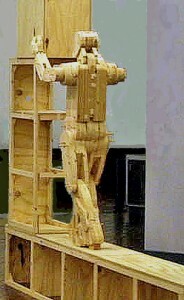 Fifteen years ago I started working with a video camera and I returned to making work using the human figure. In the videos the people are sometimes “performers”. Otherwise they are just themselves. Always their actions are limited by routine and by the spaces they occupy. Sometimes they are absent from the spaces made to accommodate them. The sculptures are determined by mechanical limitations which derive from the nature and restrictions of their imagined activities. The projects refer to preoccupying, interrelated ideas. The narratives of individual pieces are based on specific people and events while their form relates to aspects of experience as it is being shaped, in part, by contemporary technology. Therefore they are open-ended and, in a sense, incomplete. Previously in representing people my reference was their physical movement and containment in space, ritual and architecture. 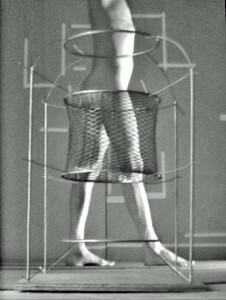 More recently the real physical movement of the mechanised pieces looks towards our conceptual, cultural limitations.